#SPS 2012: Successful if not quite hitting secure note! This was one of the first tweets we saw on this, possibly the biggest automation exhibition in the world this year. 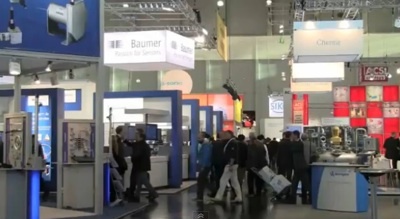 The SPS/IPC/Drives show is held annually in the Northern Bavarian city of Nuremberg. This year the dates were the 27 to 29th of November, As last year we were unable to make it this time, however there were some excellent reports which we have used (and linked to) in compiling this brief impression. As might be expected the automation industry presented its capabilities in full force at the exhibition. There was a record number of 1.429 exhibitors which attracted more visitors than in the past, as 56.321 trade visitors filled the 12 halls to gather information about the latest products and solutions in electric automation. Well may it be said that SPS IPC Drives 2011 set a clearly positive sign for the future despite the gale-force winds blowing in financial circles for the last three years. The conference which took place in parallel to the exhibition also recorded an increase this year with an attendance of 349 delegates. For three days the conference provided a platform for intensive discussions between product developers, suppliers and users. The opportunities for users to exchange information and knowledge were at the heart of the newly introduced user sessions. Like a lot of European events there was not a small number of tweets from various sources and in various languages, but those that did tweet helped form an impression of how things were. One of the most prolific of these was Leo Ploner of the IE Book who gave us a sort of running commentary on his day interspersed with twitpics of stands and products which impressed him. This comprehensive collection of pictures have been added to the IE Book Facebook Page and we recommend that you pay a visit and see who you know and what products impressed him. 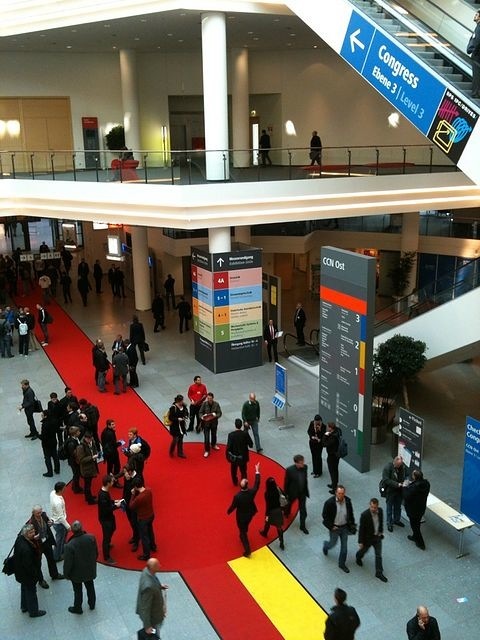 “#SPS/IPC/Drives very busy on the first day of the show. Big crowds at all the stand” he reported after day one. Gary Mintchel of Automation World also found himself in Nuremberg during this week. His blog, Feed Forward, provides us with “a roundup of various announcements that I gathered during my sprint around the halls and press conferences.” He managed to squeeze in a visit to the Siemens plant in Amberg on the day before the show opened! The Control Engineering Europe team attended the show in force, collecting a great deal of feature ideas, as well as details about some of the most innovative launches at the show. They promise that further details of the most exciting product launches from the event will be presented in the February issue of the magazine. ARC Advisory also discuss day one in an article by Florian Gueldner which looks at the Automation Outlook for 2012. He bases this report on that of the ZVEI, as well as companies interviewed at the event. Their David Humphrey reports on The big trends in a further report on day two. A busy corner at the show! Of course exhibitors tweeted on their own stands and new products. Heading the posse was Siemens, who were on their home ground and virtually occupied one complete hall (There were twelve halls in all!). They mounted an impressive press conference on the first day. Their “big” announcement was the naming of their full motor range, now called “Simotics”. They also introduced some extensions to their TIA (Totally Integrated Automation) portal. Jochun Koch’s blog features some video presentations with English voice-over – Automation and IT (their Scalance range) – take a look and remember to click for the English translation if needed! 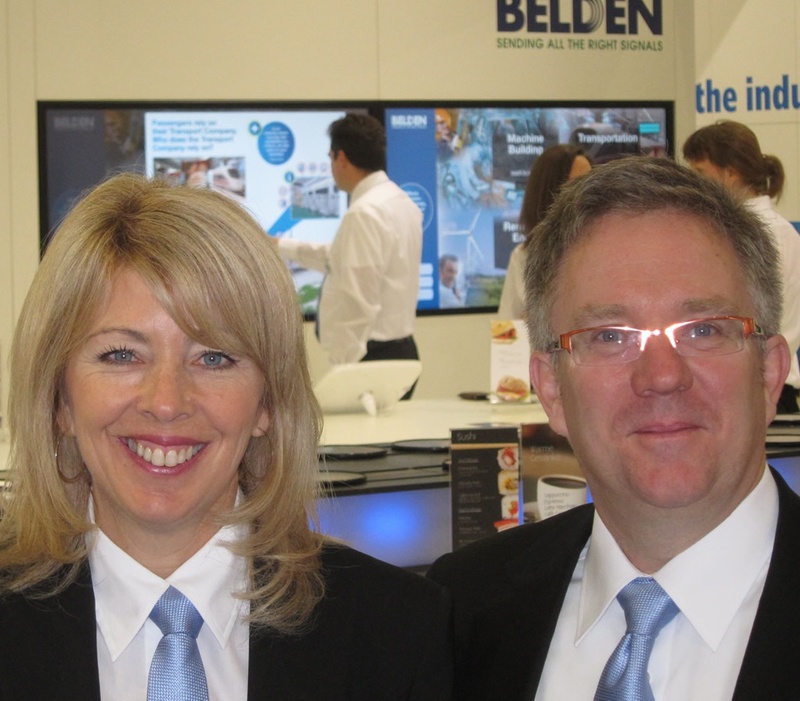 Also using video to press their message is Beckhoff who have produced reports for each day. This is Day One. They exhibited their complete range of PC- and EtherCAT-based control technology and a large number of new products in all technological areas (IPC, I/O, Automation and Motion). The focus was on their new generation of controllers from the CX2000 series, the new proprietary-developed AM8000 servomotors and the release of the TwinCAT 3 software. News of PROFINET and PROFIBUS at SPS/IPC/Drives is trickling out said Carl Henning of his ProfiBlog reports. Suzanne Gill of Control Engineering Europe reports here on some of the latest innovations that were introduced, which evidenced consumer technology moving into the industrial space and multi product combinations continuing to gain momentum. We give some more releases from exhibitors on our Conf/Exhibitors pages. Eric & Joann Byres at the show! We referred to the excellent tweeting by Leo Ploner of the IE Book earlier and his very comprehensive report Industrial networking still looking good tells in great detail what he saw as he moved through the halls. We’ve referred to their pictures above and here is a video which he took of an exhibit at the Sercos Stand. Equipped with an MLP industrial control from Bosch Rexroth, the robot guitar can read and play MIDI files. Bus terminals from Phoenix Contact are used to actuate lifting solenoids. Six to pluck the strings and 24 to operate the finger board. The automation bus from Sercos ensures the optimum operation of all components. Next year’s automation filled show is scheduled for Nov. 27. – 29 2012. Will you be there? Releases received at the Read-out Offices! This entry was posted on Thursday, December 1st, 2011 at 4:06 pm and is filed under Automation, Events, Instrumentation, Process Automation, Security, Technology, Training/Education. You can follow any responses to this entry through the RSS 2.0 feed. You can leave a response, or trackback from your own site. One Response to #SPS 2012: Successful if not quite hitting secure note!